If you like TV shows and movies, Netflix is pretty great. The streaming service is one of the quickest ways to lose hours upon hours of your free time to popular media, and I'm cool with that. Netflix's algorithms always seem to suggest shows I end up liking, but there is one thing I don't like - its dubbing and subtitling. 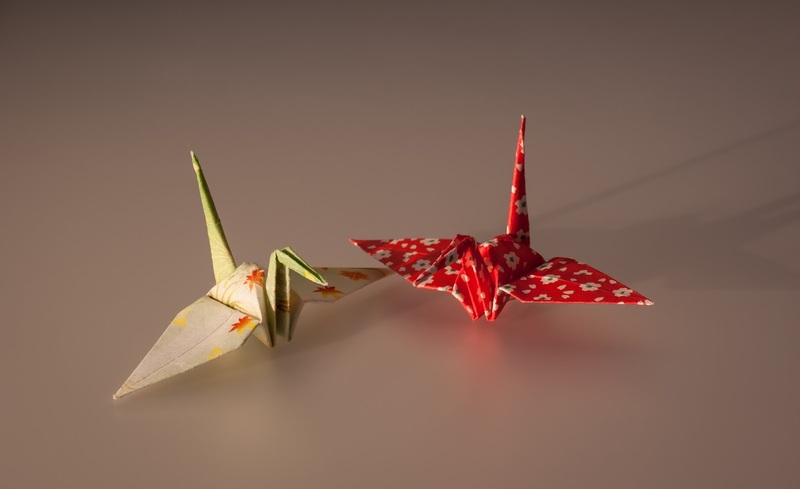 Origami, another of Japan's fine artistic exports. In the past, we've discussed dubbing versus subtitling at length (I tend to prefer subtitling over dubbing where possible). However, when watching anime (Japanese animation) I tend to take it on a series-by-series basis. If the subtitles are good, I will happily watch an entire series with the original Japanese dialogue. However, when anime subtitles are bad, they are really bad! The internet is full of great examples of this. Before I get into this rant, I need to clarify a couple of terms. For the purposes of this post, I'm taking "closed captioning" (CC) to refer to user-activated text that is generally used for those that are hard of hearing and "subtitling" to refer to a translation of foreign language dialogue that is not likely to be understood by the viewer. A quick way to distinguish whether you're watching CC or subtitling would be to see whether there are descriptions of sounds that wouldn't be considered dialogue, such as "[Phone rings]". Aside from the bad grammar, unnatural syntax, or odd vocabulary choices present in bad anime subtitles, Netflix has a great way of making subtitles completely redundant. Aside from their low linguistic quality, I firmly believe there's also a technical issue at play here. When I watch anime series on Netflix, I usually have two options for audio and two options for subtitles. The audio is available in either Japanese or English, while the subtitles are only available in English and can be "off" or "on". This is what causes problems. The subtitles, just like the dubbing, are a translation of the original dialogue in Japanese. However, they are clearly not done simultaneously, nor do they appear to have any relation to each other. On the one hand, the dubbing tends to have altered the original dialogue to make it fit better with the timing of the characters' speech, as well as make the lines more natural and easier to deliver by voice actors. On the other hand, the subtitles tend to more strictly follow the meaning and structure of the dialogue. The massive difference between the dubbing and subtitling means that I find it almost impossible to have both dubbing and subtitling active at the same time. Since you can either have all of the subtitles or none of the subtitles, Japanese text that appears in subtitles, such as explanations of time passing or where a scene takes place, are left untranslated. This is when I really get annoyed. I have to pause, turn the subtitles on, and rewind back to the start of the scene, just for the subtitles to load and tell me something like "One week later". It should be noted that Netflix has also received criticism from deaf communities for the low quality of its CC. As much as I love the fact that it allows me to binge on watching massive robots and ninjas fight each other, it really needs to work harder on its foreign materials. What do you think of Netflix's subtitling? Love it or loathe it? Are there better streaming services for subtitling? Or worse? Tell us your thoughts in the comments below.